"Whimsical Birds," To me birds are one of "the most" beautiful creatures of all my garden art. You may not think of birds as "Whimsical ART", but now is the time to change your thinking. They are very attractive and can be quite entertaining, as well. We have been using birds as our main subject matter for many years. Children as well as adults love to draw birds too. It's because there are so many different sizes, colors, and shapes. In fact "nature" is a wonderful source for your art. Take a stroll around your garden and notice what's blooming, what new seeds are sprouting, or what birds are at your feeder. Think about what a lizard eats or where are all those ants going? You can get some wonderful ideas from "nature". Let your imagination "out of the box". This is a good time for you to have some "alone" time or to spend quality time with your family. "Art" is all around us, if we would only take the time to "LOOK"! activities that you can do that involves your whimsical birds. Besides the usual feeding, watching, drawing, and taking pictures of birds, you can also make some very unusual art for your "real" birds to use. One thing is bird feeders. 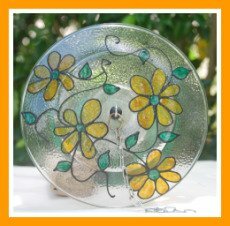 Birdfeeders add so much beauty to your garden. They come in many styles, sizes, shapes, and decorative versions as your birds do. There are feeders made of other materials like plastic, metal, and ceramic. The wooden bird feeder seems to be the most popular. It's good to keep your feeders filled, not only in the summer, but during the winter months too. This is when birds have trouble finding food. Feeding wild birds is very amusing. You can even make your own bird food using **Bird Seed Recipes** After feeding your birds for a while you will know what bird seeds they like most. Like I said earlier.. 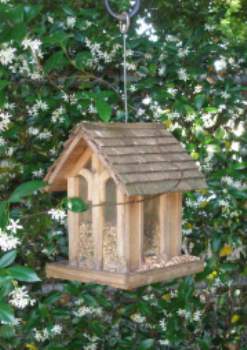 There are so many activities that you can do just by having feeders and birds in your garden. It's fun to make a chart and keep track of all the various types of birds that visit your feeders. The kiddos really enjoy doing this. I have included some ** Bird Crafts** for you to try too. By making bird crafts or any of the other crafts that I offer, you can spend some quality time with your kids while doing something good for them, for you, and for our feathered friends. You can be all about birds too, by attracting certain bird species, to your garden. You can do this by putting certain types of foods in your feeders. Of course you could be like me. I love all the birds. As long as they come, I'm happy. My husband,(he's all about birds too) makes a feeder. I call it the **Shabby Chic** feeder. They are very pretty. After he's through with the construction, I use special paint to put designs on them and to give them that extra sparkle. "Lights" - "Camera" - "Action"
Get out the special bird watching binoculars, your camera, and your journal and let the fun begin. 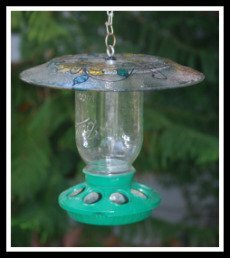 Another birding activity that has become very popular and is easy to do, especially, when you have your own backyard birds. 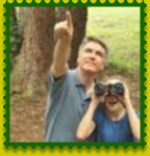 **Bird Watcher** A bird watcher is all about "whimsical birds" and truely enjoys the sport. I know I do. If you decide that you want to be a "really" involved Bird Watcher, there are many events in your area that you can participate in. They are usually sponsored by the Audubon Society. **Bird Photography** This is another popular enterprise for garden enthusiasts. Taking photographs helps you keep records of the birds that visit your garden and feast from your bird feeders. Taking photographs will also help you to identify each bird species. It can be kind of difficult at first, but after a while you will become a pro. I have seen some very nice bird prints. It's a good way for you to decorate the walls of your home too. Walking in your garden with your camera can be a great stress reliever too. When I'm taking bird pictures I forget about the worries of the day. I sit in my swing, relax, and wait for the next memorable moment. You don't have to be a professional photographer, just Have Fun! experiment and try different techniques. You will be surprised at what you will achieve. Now days it's easy to print your own pictures right from your computer. So, make it happen for you and become Whimsical Bird Fan! Above: This is the top of one of my "Shabby Chic" feeders. Below: My "Shabby Chic" feeders. Feeders can be found in the Goodies e-Store.